The proliferation of mobile phones has brought with it an increasing number of warnings regarding their effect on health. Everything from an increase in the frequency of brain tumors to an increase in blood pressure levels has been attributed to cell phones. The main reason for most of these warnings is the radiation emanating from mobile phones. Mobile phones produce a form of radiation that is 'non- ionizing'. This differs from radiation such as x-rays and gamma rays that have been known to damage DNA. However, radio frequency produced by mobile phones can produce heat and prolonged exposure may cause some damage over the long term. However, the effect that mobile phones have on health has proven very difficult to assess because of their relative recent advent. In addition to this, certain conditions such as brain tumors are extremely rare and slow growing, making it difficult to pin the blame solely on mobile phones. However, mobile phones may be indirectly responsible for an increase in blood pressure. In this regard, the finger of suspicion does not fall on radio frequency radiation. Rather, it is the stress that mobile phone conversations engender that is thought to be the cause of an increase in blood pressure. New research has indicated that talking on a mobile phone may trigger an increase in blood pressure corresponding to the 'surge' that occurs with each heartbeat. In a study conducted on 94 mildly hypertensive patients, 12 blood pressure readings were taken at one minute intervals. The test subjects were left alone in a doctor's consulting room after the first blood pressure reading was taken. 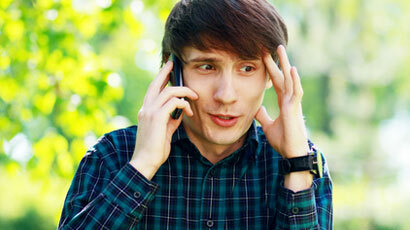 The subjects were called at least three times on their mobile phones by researchers. During these periods it was found that on average, the blood pressure increased from 121/77 to 129/82. The increase in blood pressure could be attributed to the anxiety that an individual feels when receiving or making a call. Researchers also found that those individuals who received thirty or more calls every day seemed to have developed some form of immunity to the blood pressure spikes. While studies such as the one mentioned above are hardly conclusive, they do offer one explanation for the increase in the incidence of hypertension and other so-called 'lifestyle diseases' in these times. In fact, hypertension is estimated to affect almost a third of the adult population in the United States. Being constantly connected to the workplace and home can trigger an increase in anxiety levels and make it more difficult for an individual to disconnect from the pressures of work and everyday living. Anyone who has a mobile phone and has received a call from the office while at home can attest to this fact. The increase in health warnings with regard to mobile phones have prompted the Federal Communications Commission (FCC) to set limits to the Specific Absorption Rate (SAR) of a mobile phone. This is a measure of the amount of radio frequency radiation that a user absorbs. However, whether or not the allowable SAR rates are enough to protect against potential long term health hazards is still debatable. As of today, no conclusive evidence exists which proves that mobile phones can cause an increase in blood pressure or any other adverse effect on health. The U.S. Food and Drug Administration (FDA) as well as the National Cancer Institute both state that there is no evidence linking mobile phones with any health problem.